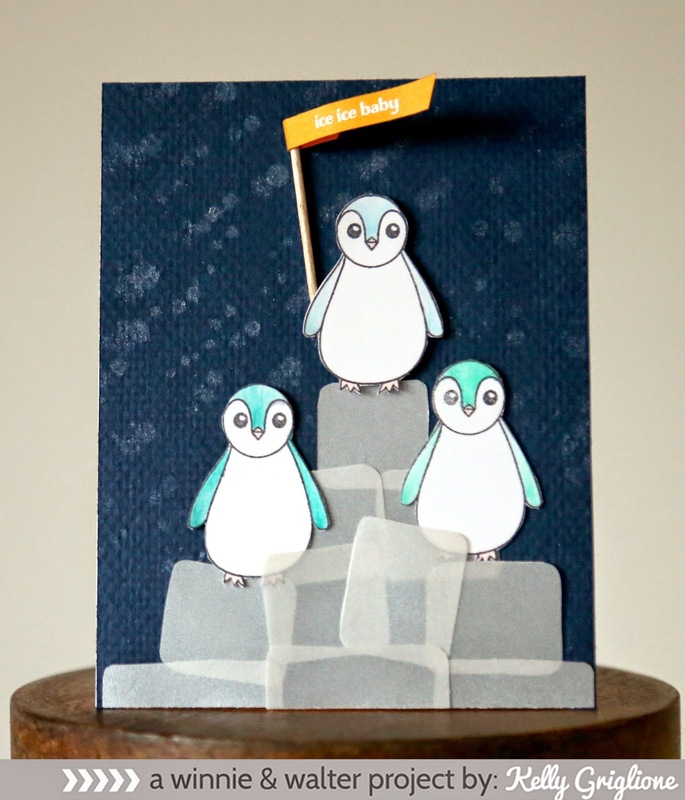 Seriously, that sentiment alone is worth getting this small-sized penguin set! Totally cracks me up, especially paired with their sweet expression. For the banner (held with a toothpick by the head penguin) I chose a yellow-orange since that's the penguin's beak color. 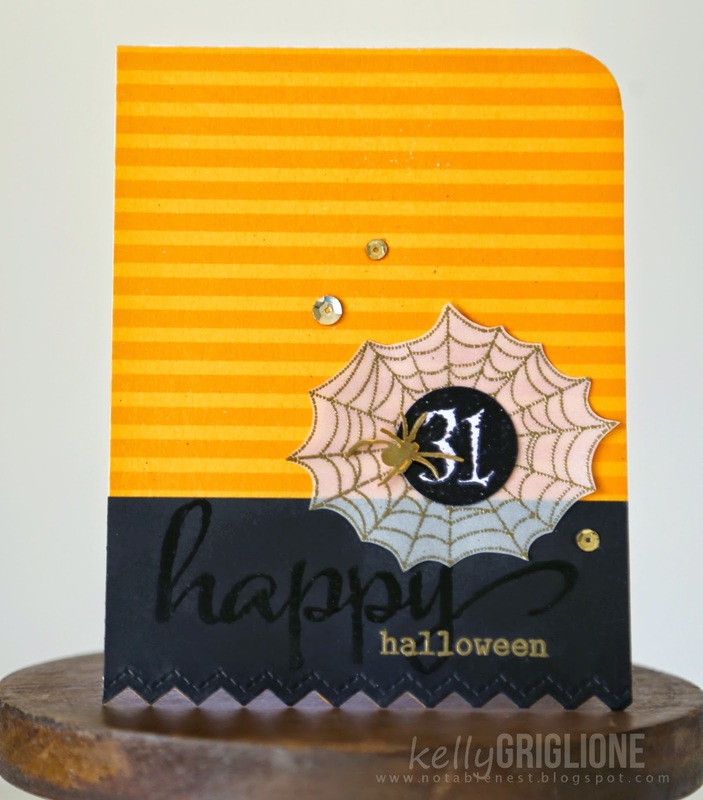 Yellow-orange stripe paper is lined inside the card. The background was a mistake, actually. 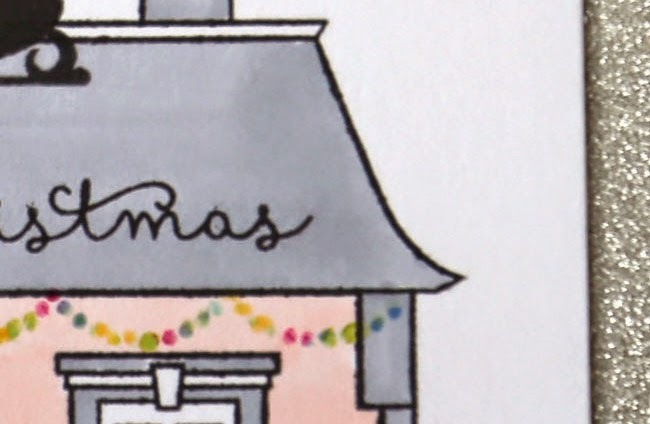 I originally had this for yesterday's card with Santa on the rooftop. White glimmer mist is sprayed through the circles creative screening, but I wanted it a little darker so I sprayed again. As you can see, I did a lousy job lining up the stencil. No where close! But after looking at it awhile I thought it would make a great snow storm background, like when the snow is coming down so hard it's just streaking by. The vellum ice cubes are cut free-hand to look more natural, and overlapped slightly for effect. Even as I'm writing this I'm cracking up at "ice, ice, baby." 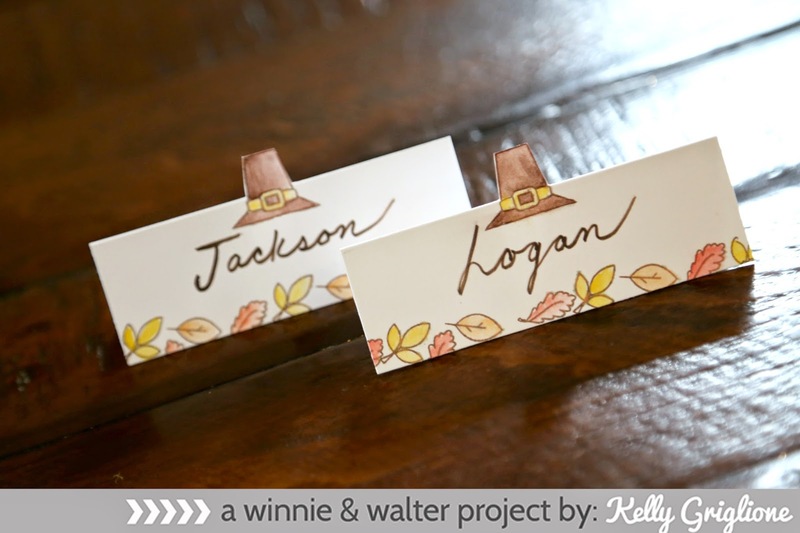 Thanksgiving is not overlooked in this release ... here's a small Stampets: Turkey set. 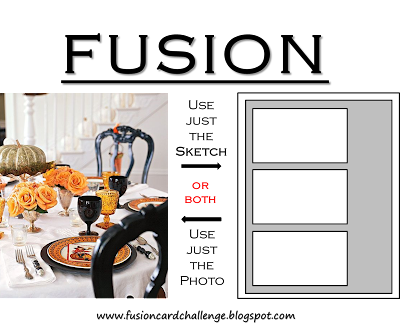 Even if you're not having a large, fancy meal I thought these name cards would be fun to set out. They take minutes to make since they are so small. Each leaf (I lined up 4 at a time on a block) is one or two swipes with a watercolor brush. I stamped the hat across an imaginary fold line, then figured out where the middle is and scored on either side of the hat. I used an exacto to cut the portion of the hat above the fold line. This way it pops right up when you fold the name card. You can see the back of one above. 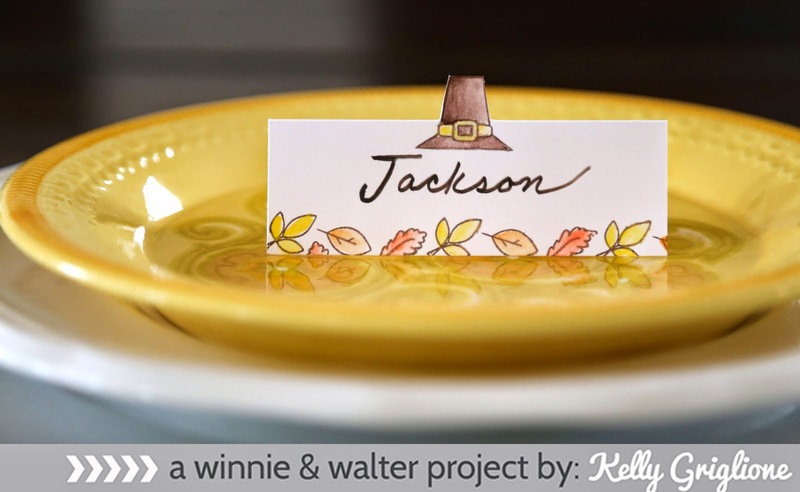 A great way to add a little color to your table! 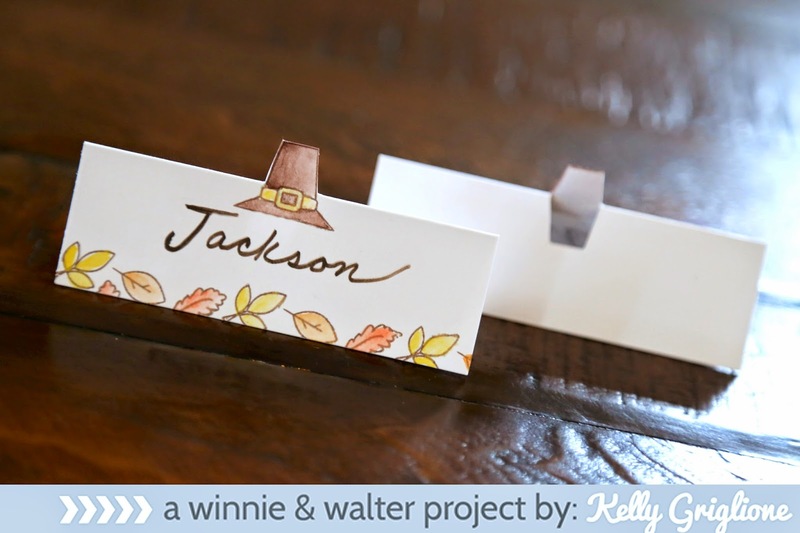 All stamps, stencils and dies go on sale at Winnie & Walter today at 8 pm CST. For what could be the largest w&w prize EVER, make sure you comment on this post for a chance to win the entire October release. With ten stamp sets and two entirely new product lines, you will be overwhelmed with how big the prize is! (affectionately called "cut-aways"). And not just any old dies, but dies for the super-popular scripty words! It's a no-brainer that these word dies will quickly find new homes once they're released. The word dies in my home have already gotten quite a work-out! 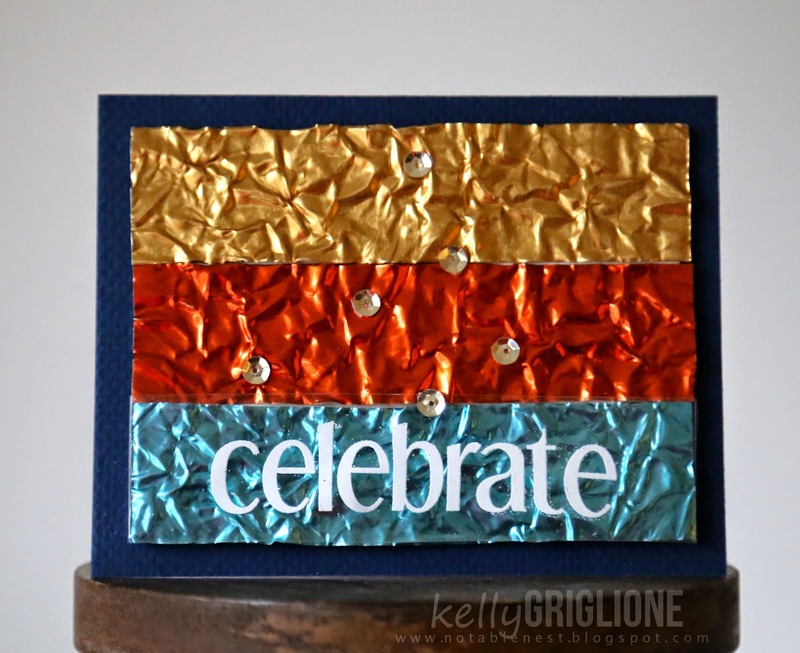 Especially the "joy" die which was used on this card to create a tone-on-tone background. I love having a secondary sentiment like this that is decorative as well as communicating an additional message. On the inside of the card I used a bamboo patterned paper (American Crafts, Lucky Charm) because it gives the feeling of straw in a manger to tie back in with the front of the card. 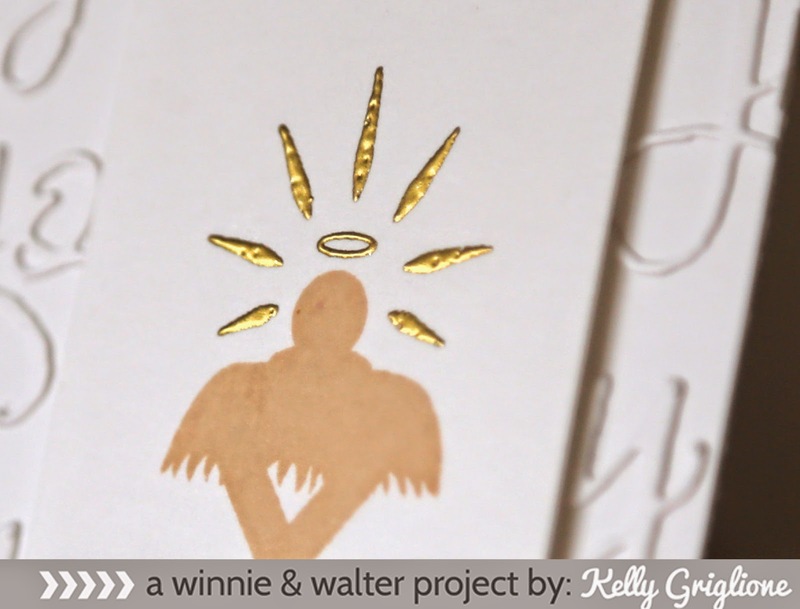 The shining halo is a separate stamp so you can emboss it in gold. 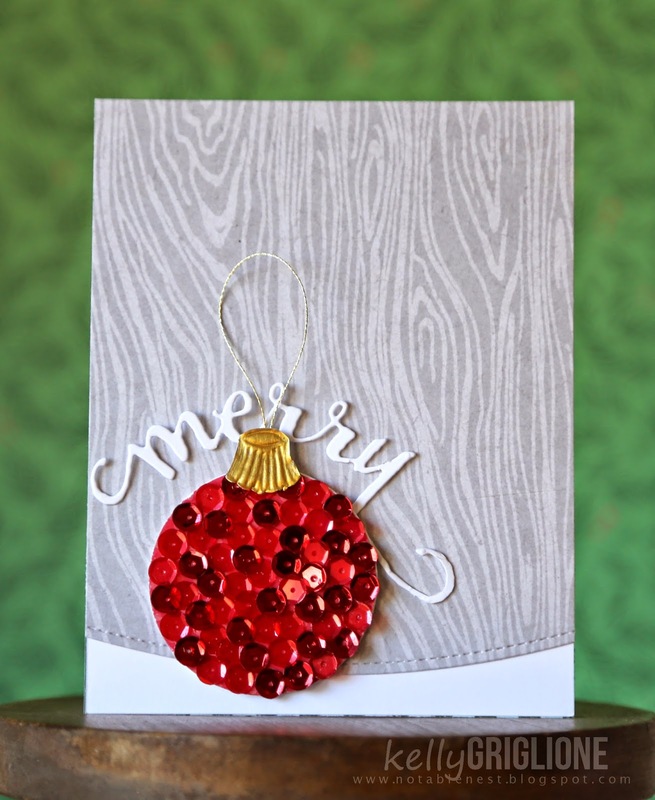 The next card has a background with embossed snowflakes, blended ink, dropped water and clear sequins. Words from the Big, Bold and Merry set make a frame around the edge. To break between the "wishing you" sentiment I used a tiny snowflake. Those tiny stamps always seem to come in handy! I used 4 layers of 110 lb paper for the cut-away words. Love how substantial they look, and it really helps to stand out on a busy background. I tried positioning the "joy" so the dot would be the center of a snowflake. 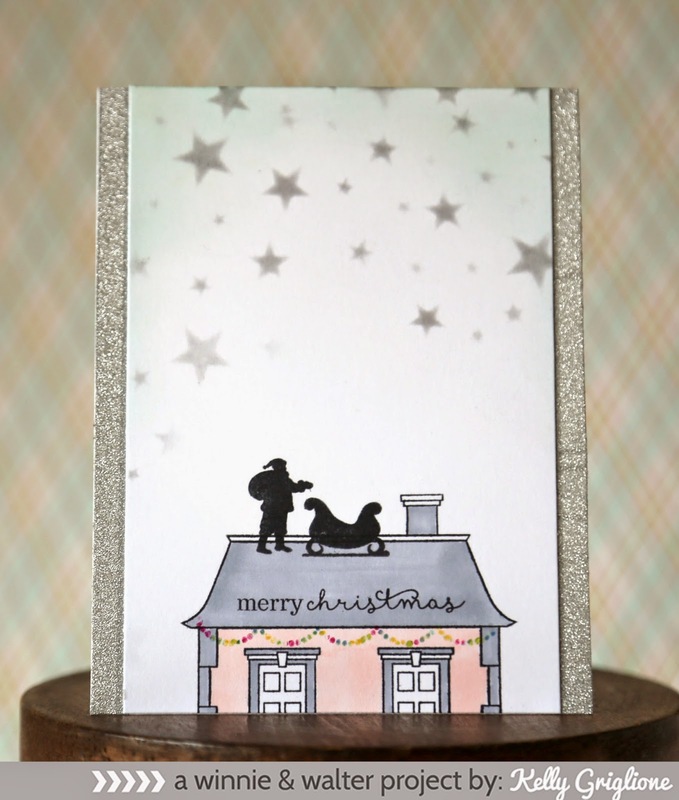 This card uses the large-sized Happy Christmas set, which is packed full of scene-builders and sentiments. It also has add-ons to This Awesome House in the form of Santa, his sleigh, his reindeer, and a lamp post. Since I wanted the focus to be Santa and his eventual route into the sky, I only stamped the top part of the house. I sponged black ink into the star creative screening to show all the work Santa has in front of him. 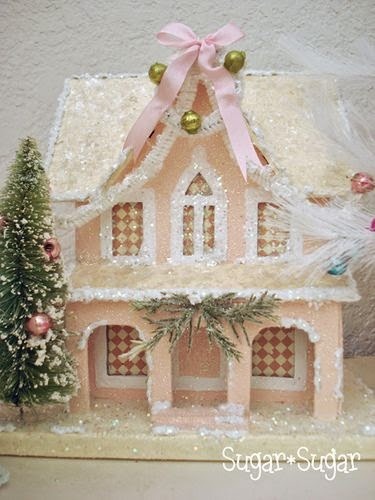 I had those charming, vintage Christmas houses in mind, so I chose muted colors like pink, aqua and silver sparkle. I about squealed when I realized the scallops from Moonlight would make the perfect Christmas lights on this house! I colored them with Stampin' Up stamp markers. American Crafts Pow! Glitter paper is on the sides of the card. For what could be the largest w&w prize EVER, make sure you comment on this post for a chance to win the entire October release. With ten stamp sets, all the stencils and all the dies, you will be overwhelmed with how big the prize is! Hi folks! Another great set of stamps are showcased today! 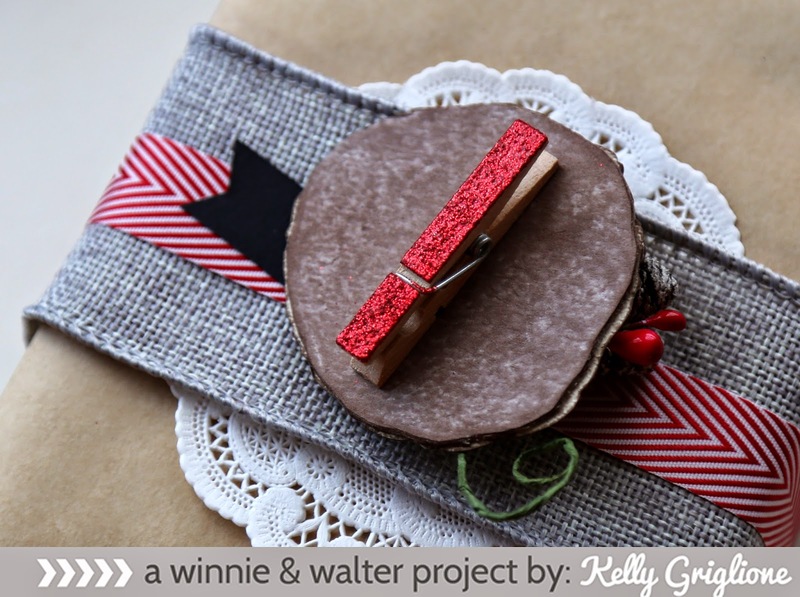 There are several holiday directions you could go with these sets, but I absolutely LOVE that Winnie & Walter included several neutral stamps with neutral sentiments (like "happy birthday", "thank you", "just for you", etc.) which can be used well after Christmas. I don't stamp any Christmas cards since I mass-produce photo cards, but I do have several friends and family with December birthdays so I was happy to stamp seasonal cards for them. All three projects in this post are from Winter Wonderland. This set has lots of great scene-building pieces, like pine boughs, berries, a few pine cones, and two different birds. 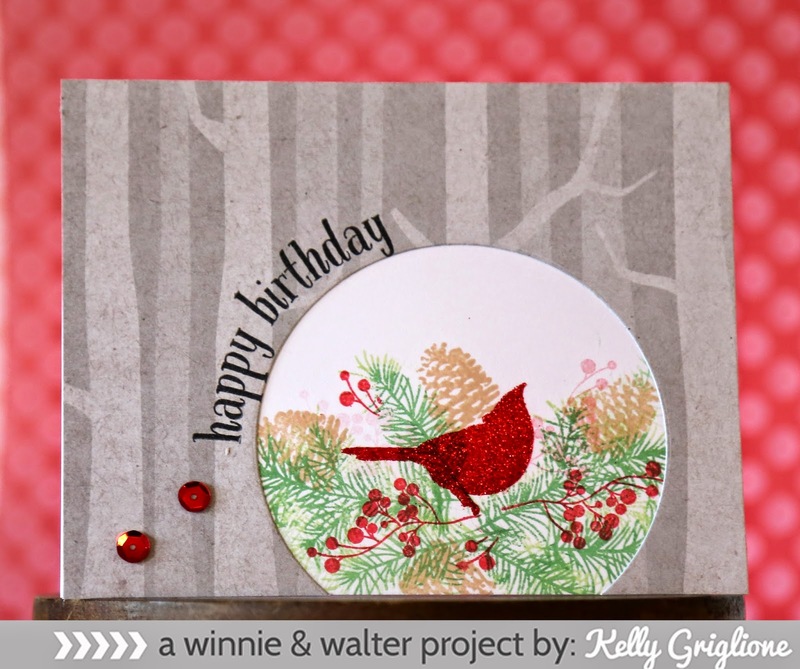 The bird on this card is embossed with red glitter embossing powder. Very wintery, but not "Christmas". 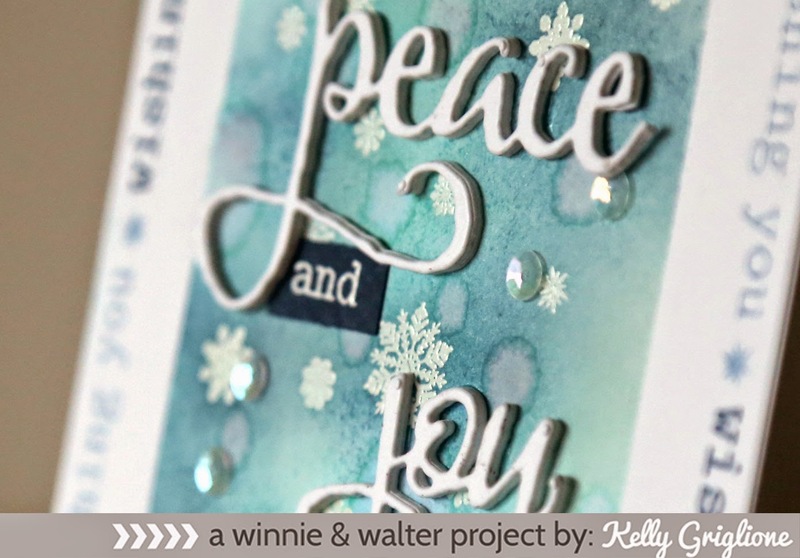 Julie and Shay have picked another great font for the sentiments in this set. This sentiment is curved around the circle, which is used to frame the stamped scene. 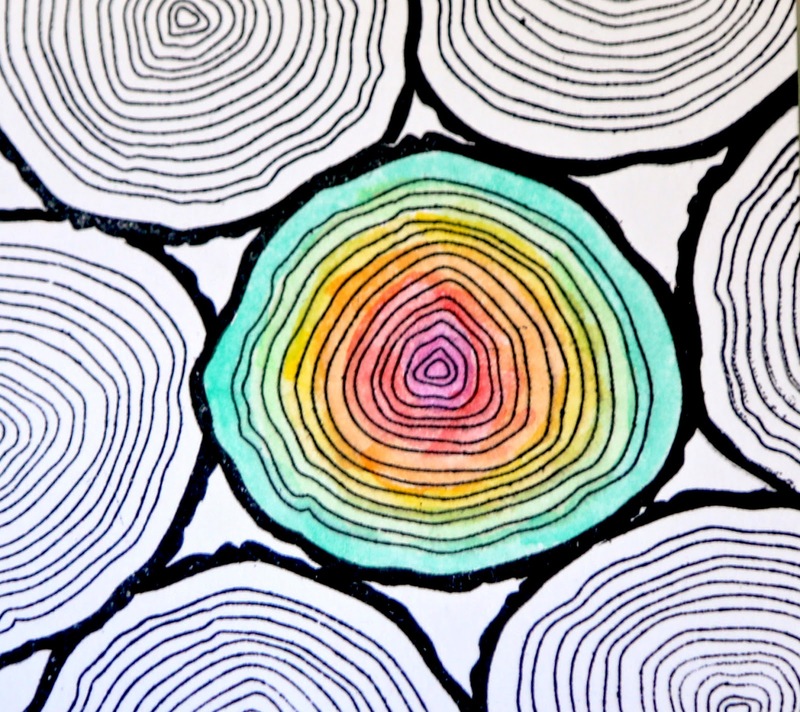 This present topper uses the other stamp that I had been daydreaming about (the first stamp is the peppermint swirl from yesterday's post) ... a cross section of a tree! Madly in love with this graphic natural element. It's such a great background and layering piece, like in this project, but it can also be a focal point like in the next project. 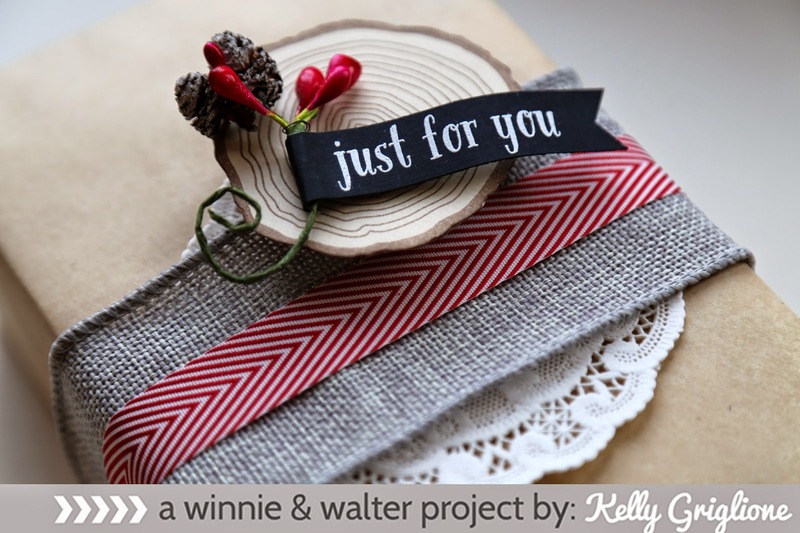 Here the natural log fits in so well with the woven fabric and the kraft wrapping paper. Stamped with brown ink on a beige paper, it looks pretty close to the real thing. When I wrap presents with fabric ribbons I'm always at a loss for what to do for a bow. Clipping on a topper like this is a great alternative to a bow. A mini clothes pin is attached to the chipboard on the back of the topper. Embossing on wood turned out well too. 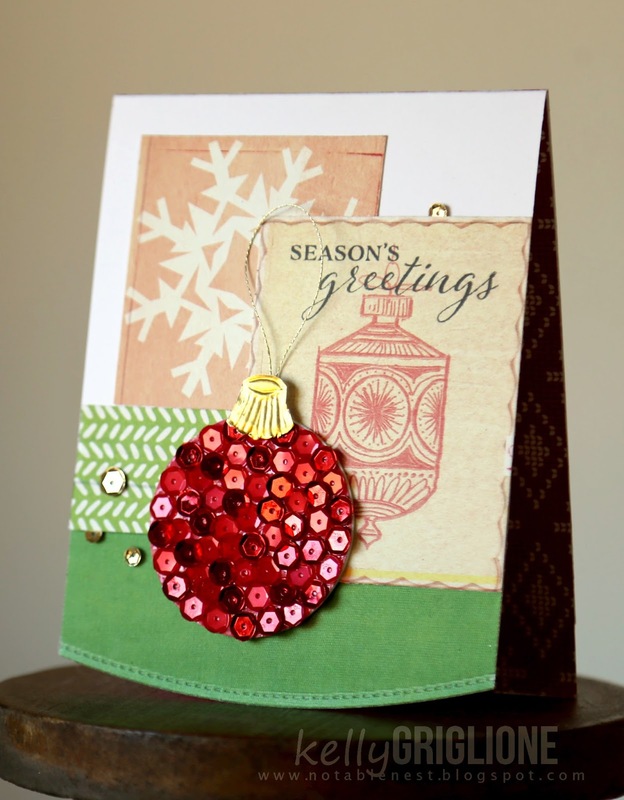 I used the same red glitter embossing powder and heat set it (twice) right on the other side of the clothes pin. So quick and easy to fancy it up a notch. Here's another one of the neutral sentiments, just perfect for the present topper. 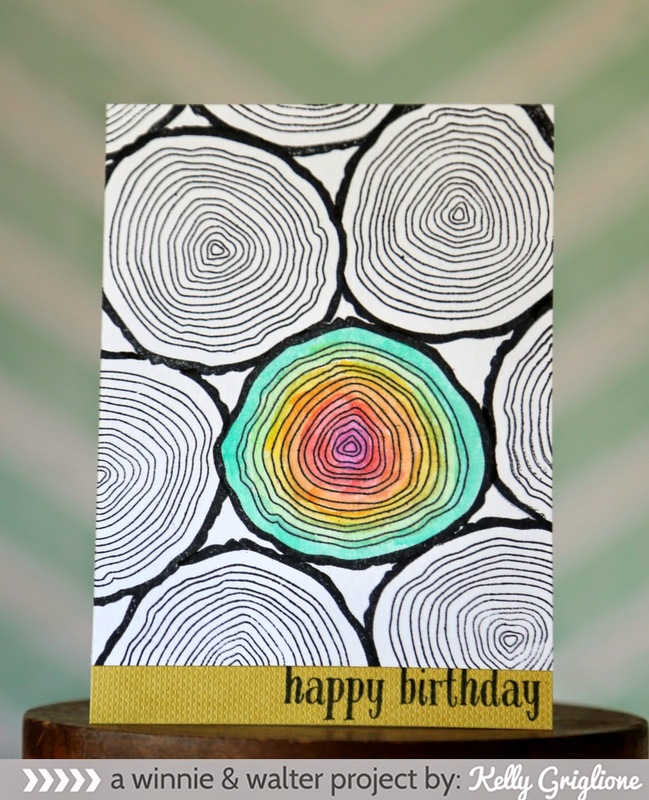 Finally, here's a card using the log cross-section as a focal point. Instead of using browns, I've gone for a more graphic look with a masked stack of black and white logs and one rainbow watercolored log. My husband's fashionable cousins are all in their late 20s / early 30s and this card will be perfect for one of them. Hi folks! 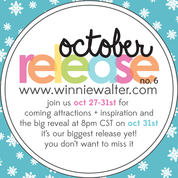 Hold on to your hats, you are absolutely going to be blown away by the amount of goodies in this latest Winnie & Walter release!! There are small, medium and large stamp sets, and TWO NEW PRODUCT LINES being debuted during this release. Let's get started! 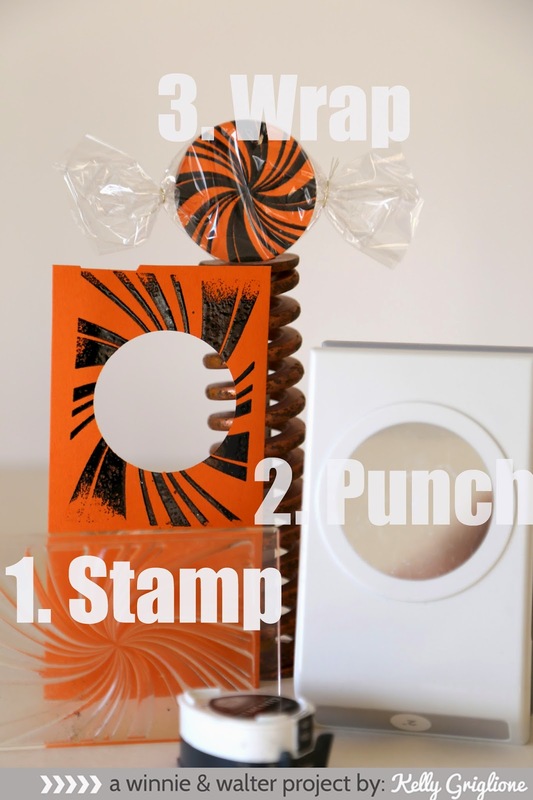 You stamp the image, punch it out with a 2" punch (you could really use any size here), and wrap it with some cellophane (tie up the ends with string). That's it! You can get a lot of different looks with just this one stamp. Stamp with colored ink on white paper, black ink on colored paper, or rotate through several different colors of ink. 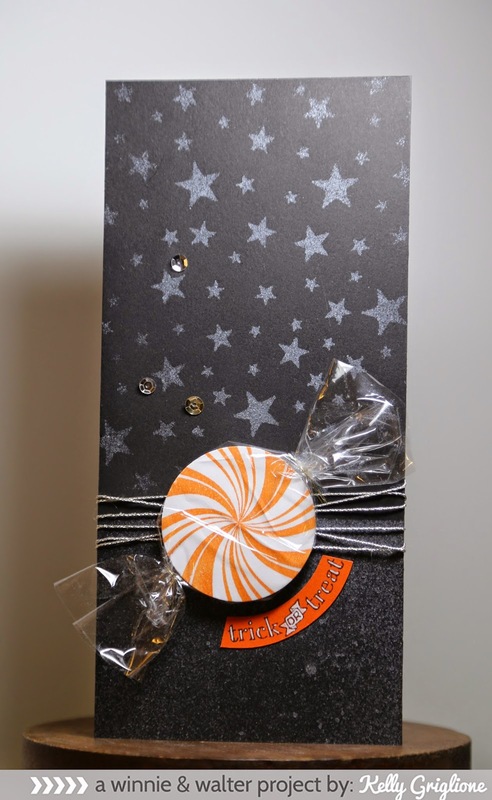 Of course you can also make a cute card with the paper Halloween candy. The "trick or treat" sentiment is from Moonlight. The background is NOT a patterned paper! It's made with one of the new product lines ... stencils!! Whoo-hoo! They are affectionately referred to as "Creative Screenings" and there are a ton to choose from. 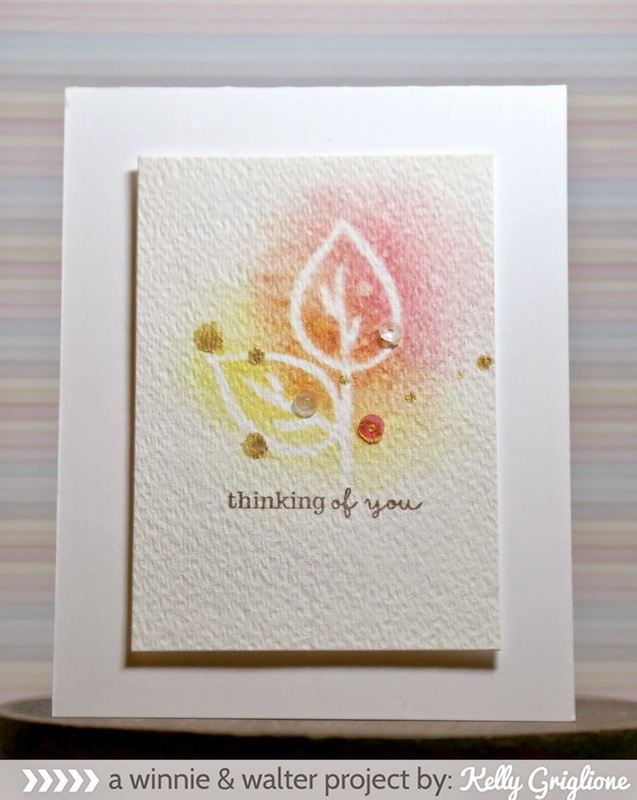 I picked the starry sky stencil for this card, and did a few sprays of Heidi Swapp White Glimmer Mist. So excited with the results after I removed the stencil! Lots of subtle shimmer going on in person. I better keep this stencil one out on my desk ... it will get tons of use! The stencils not only come in negative images (like the starry night in the last card where you color through the negative hole(s)), but also positive images like this leaf. I blended a tiny bit of color around the outline of the leaf in fall colors. 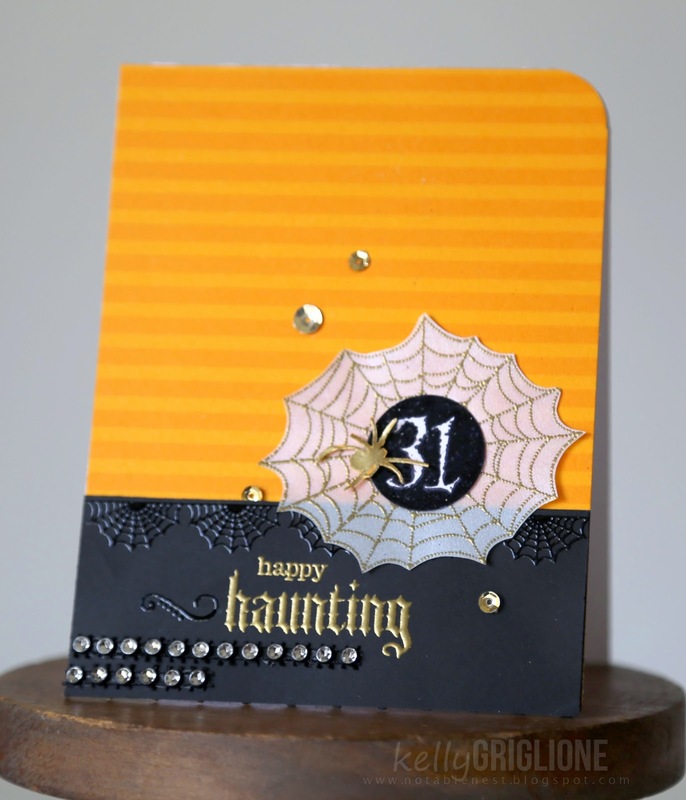 I like how you still get the feeling of "Autumn" but the card is very light and airy. The delicate sentiment is from This Awesome House. 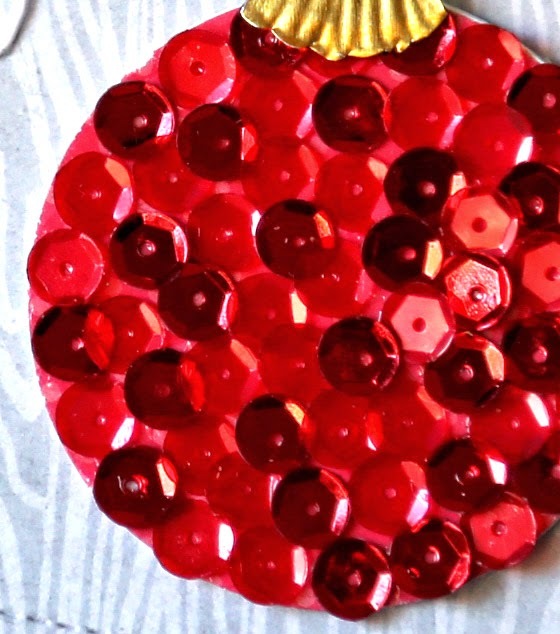 I knew I wanted to pair up the traditional metallic red sequins from A Christmas Mix, and these really neat reds with a more matte finish from Raspberry, so I covered a 2" punched circle with them in a random pattern and made a sequined Christmas ornament. 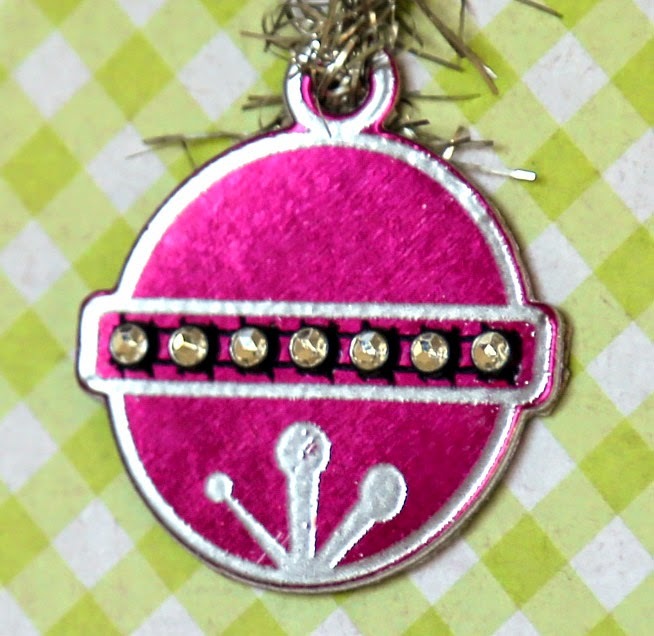 The cap of the ornament is a gold metal sheet from Add a Little Dazzle that I drew on with a pencil and cut out. 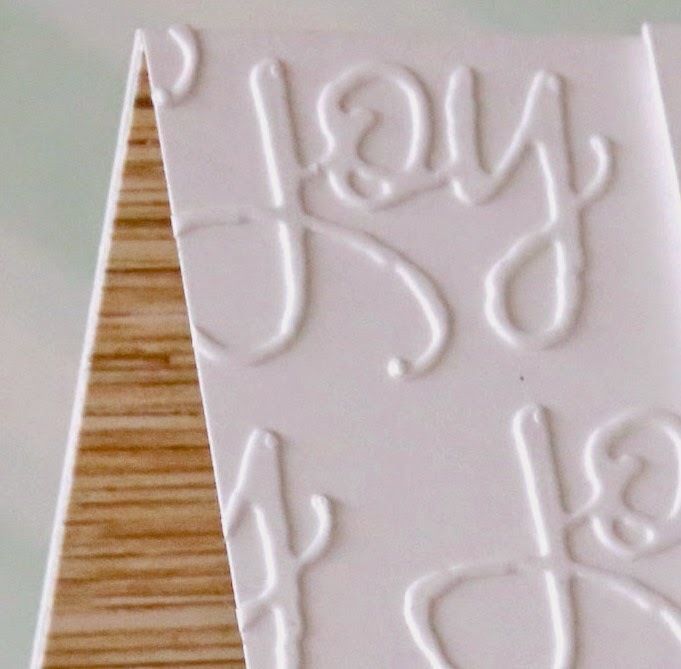 It doesn't leave any marks, but does a great job embossing when you have a soft surface underneath, like a bound notebook. The gorgeous curved AND stitched edge on the bottom is from the Pretty Pink Posh Stitched Border Dies #1. Here's my first attempt another version of the card. 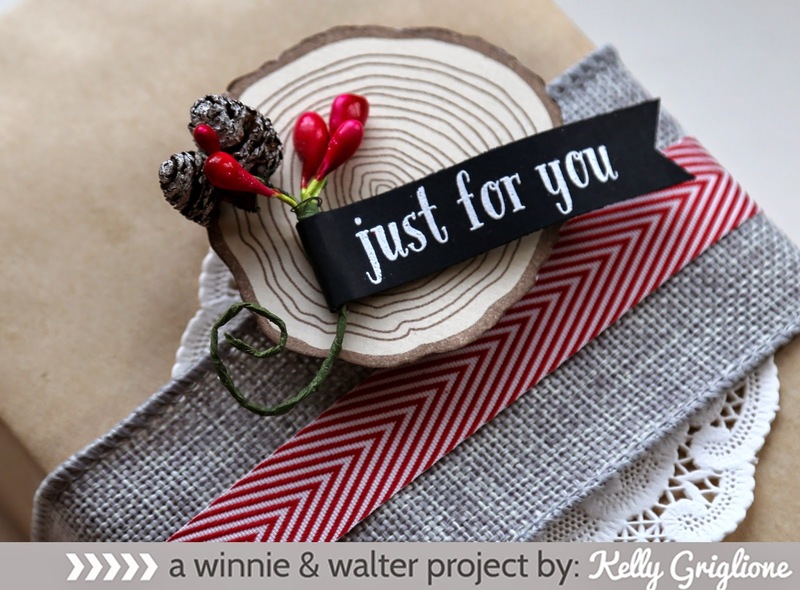 I loved combining the Studio Calico papers, and REALLY love the way the Winnie & Walter sentiment "seasons greetings" from A Tree for All Seasons looks like it was part of the patterned paper. The different-sized gold sequins were awesome to use as well. 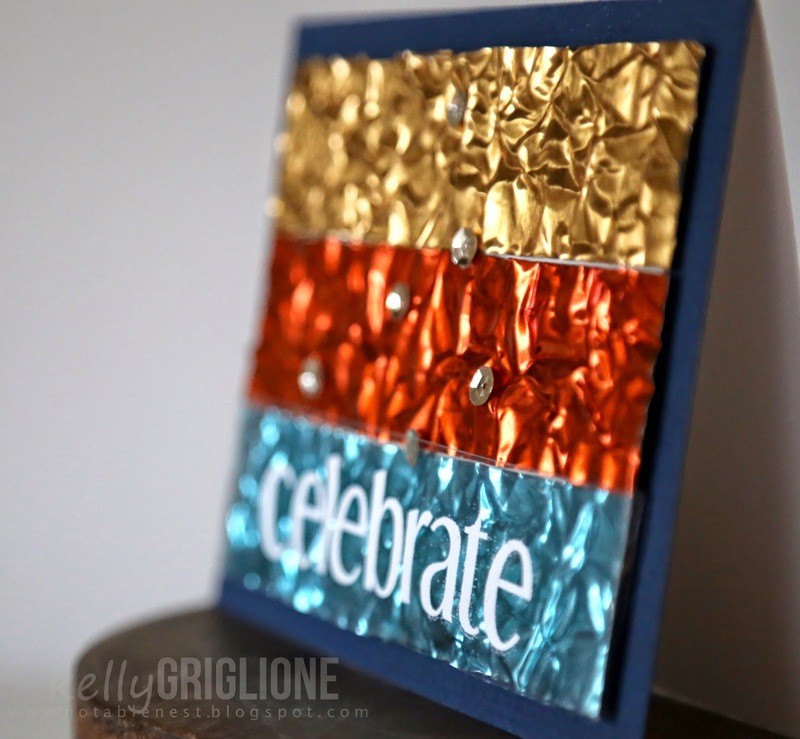 I think cards generally look more balanced with a mix of sequin sizes. 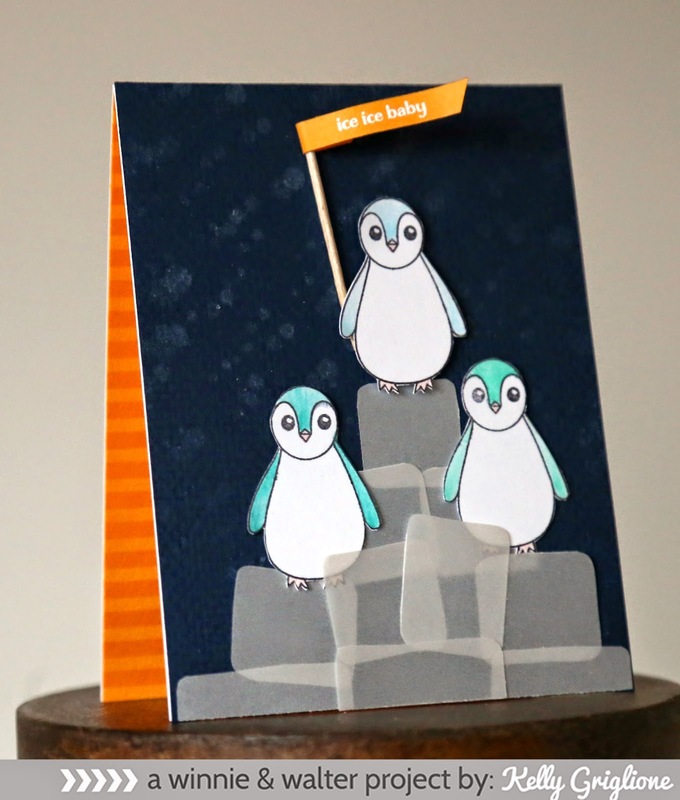 Now you're off to the amazing Laura Sterckx's blog to see her latest creation! Prizes are involved too, so as you're filling up with inspiration (have you seen the names on this list?!?) be sure to comment along the way. 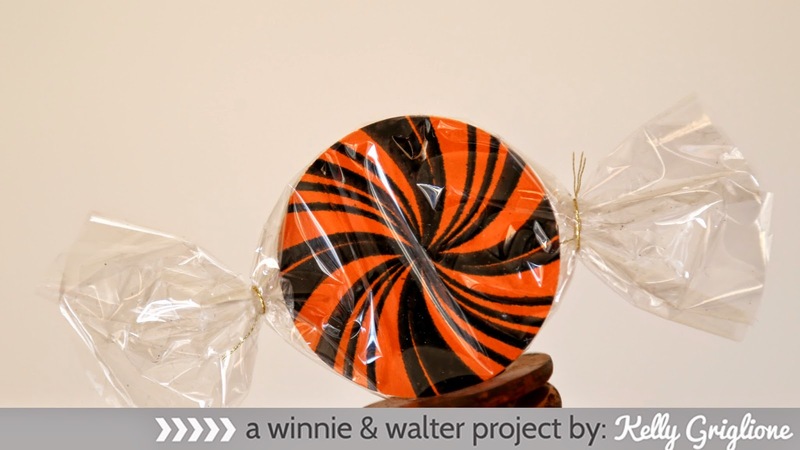 You could come away with a big Pretty Pink Posh or Winnie & Walter prize pack. Good luck! Welcome to another fun Fusion Challenge! 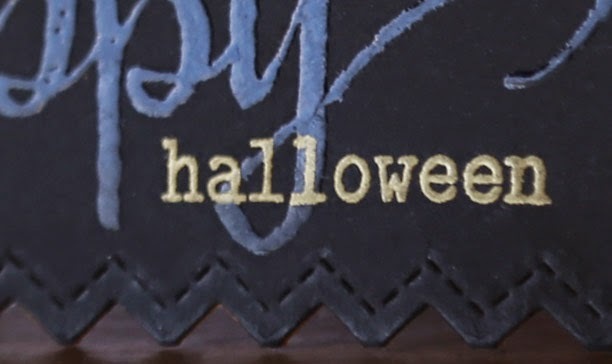 I really loved the colors in the inspiration photo ... that yellow-orange (instead of a pumpkin orange) for Halloween is so fresh. And a touch of gold. Stamps are Winnie & Walter Moonlight, and the edge die is Pretty Pink Posh Edgers #1. 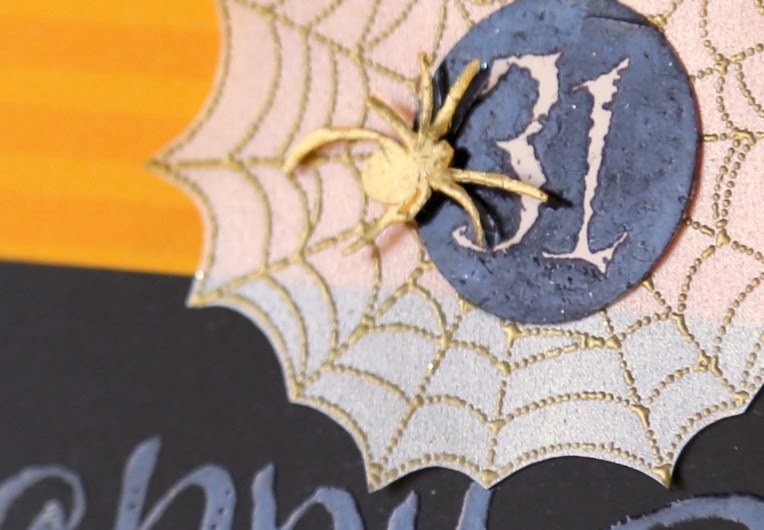 It was a little tedious, but I'm glad I cut out the gold-embossed spider. And did you notice the spider web is made of delicate dots? They look fab embossed in gold on vellum. I also like to emboss sentiments right on top of another embossed sentiment. So here's where my indecisiveness comes in. This is actually the first card I made (the black area is different). I had a lot of fun using all the different Moonlight stamps! But then I started second-guessing myself ... was I having TOO much fun?! That's when I panicked and went for the card with the cleaner design on the bottom. 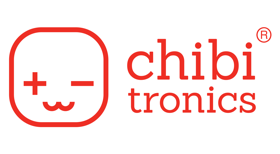 I dunno, do you all like the cleaner design at the beginning of this post? Hi Folks! I've been blessed with some good, quality time in my craft room recently. 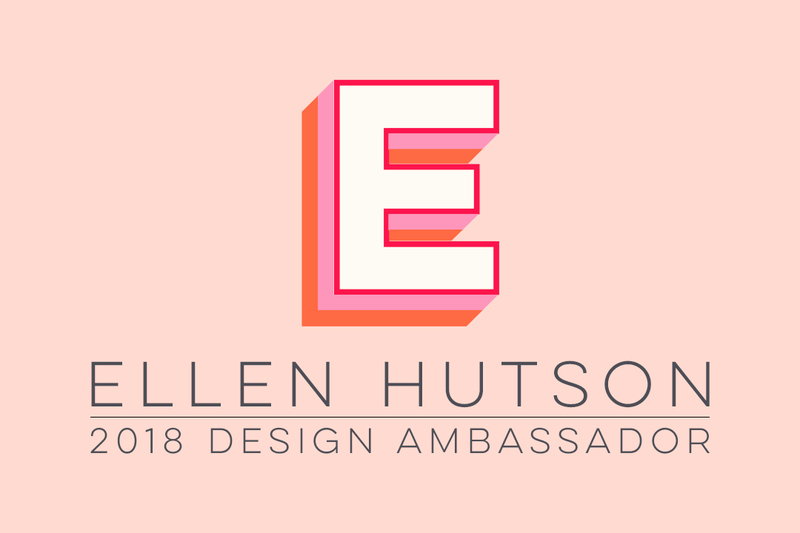 There are lots of posts coming in the next week or so, starting with this collaborative blog hop between the CAS-ual Fridays design team and the Add a Little Dazzle design team. So much fun! Sounds easy, and it is! For the most part. 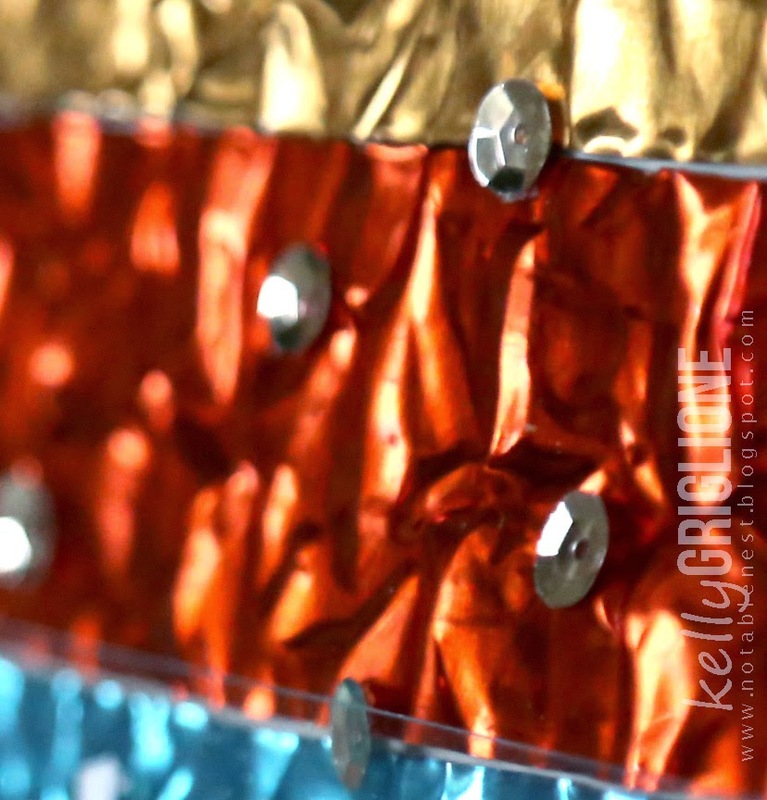 For the background I just cut three strips of the metal from different colors, scrunched them with my hands, loosely flattened them back out and mounted them on chipboard. What an effect! I wish you could see how it sparkles and shines with the slightest movement of the card (makes sense with all those different angles achieved in the highly technical scrunching process). 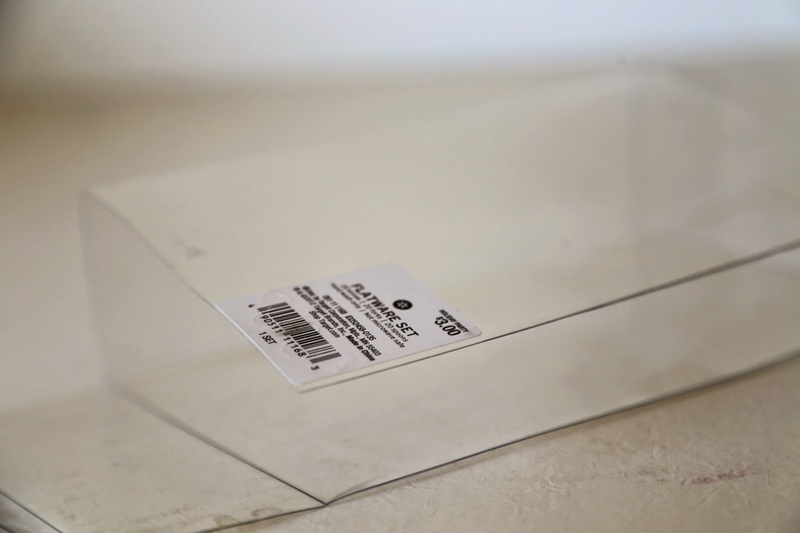 3) I moved the heat embosser VERY QUICKLY across the acetate before any serious curling occurred. Quite honestly I was amazed it worked. Any scratches that were on the packaging originally, or any stray embossing powders are more difficult to see since the background is so busy and shiny. The sentiment is stamped from the Shenanigans set. The next project uses a die cut with the metal sheets. 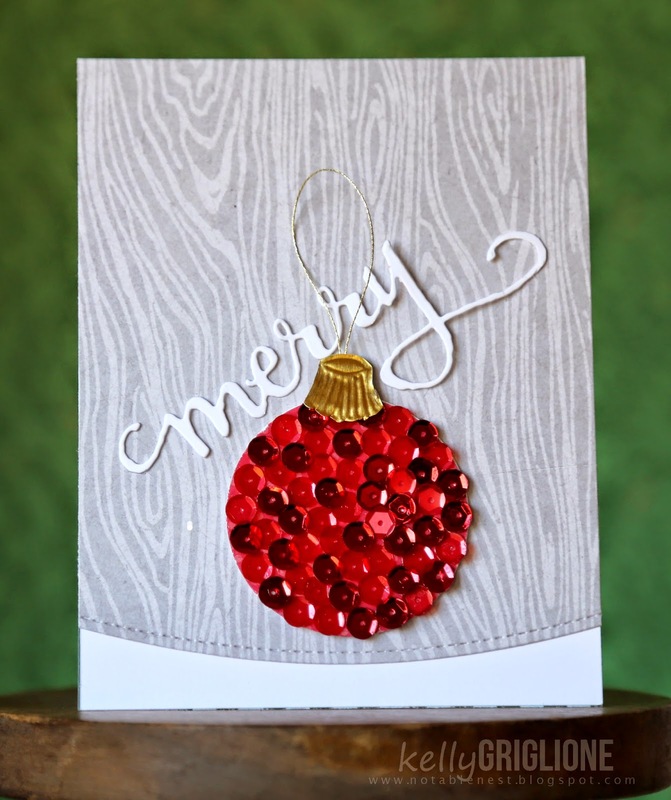 This card uses the Sleigh Bells set for the bell (stamp and die), and the Snowflake Splendor set for the sentiment. The tinsel is from Paper Source (half off after Christmas last year!) and is wrapped behind the chipboard I used to pop the panel up. Since the tinsel is somewhat bulky in the middle, I cut a channel in the chipboard so that the whole thing lies flat on the card, no gaps. Now, let's talk prizes! 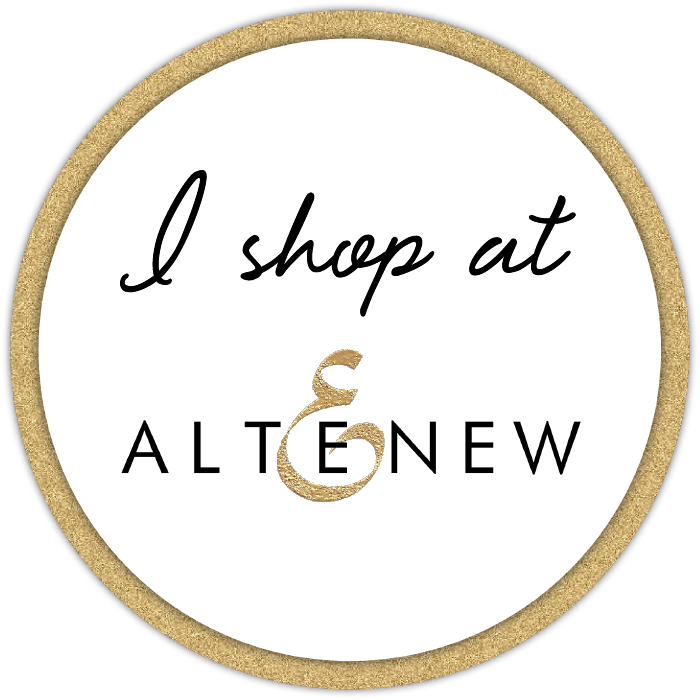 You must leave a comment on all blogs (including company blogs) for a chance to win 1 of 2 prize packs! You have until Sunday, October 26th midnight (MDT) to enter. The winners will be announced on both company blogs. Here's a list of all the places on the hop today (also see Day 1 and Day 2 if you're interested)! 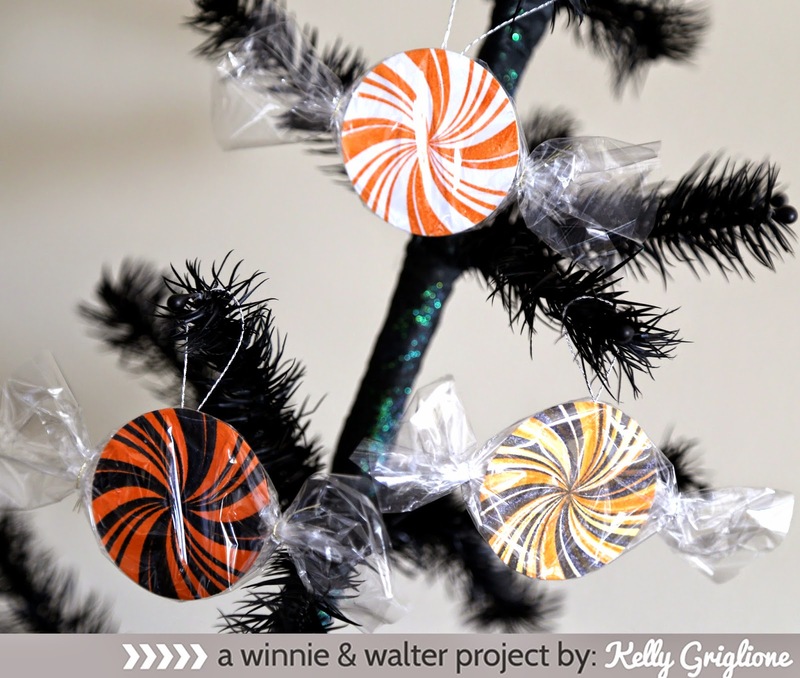 Winnie & Walter: World Card Making Day CHALLENGE!